Editor’s note: When self-proclaimed “Web Diva®” Lisa Stambaugh was forced to choose between her traditional job in Corporate America and her young family, she took the leap and turned her hobby into a new career. See how Lisa started her own web design business and overcame her challenges, and hear the advice she’d share with young designers today. Q: You didn’t have the traditional career path into web development. What inspired you to get involved in web design? A: In my early-70’s high school days, I was quite interested in both writing and art as careers. However, I was told I was “pretty good at math for a girl” and encouraged to go into technology. With a BSEE from UCSD and MSCS from Stanford (and the end of a recession), I had no problem finding work, and enjoyed many years in Engineering, Quality, and IT positions at several great companies. Eventually the demands of a high-intensity management position did not mesh well with my goal of spending more time with my young children. While still working full-time, I got into web design as a hobby, developing sites for my children’s school, a nonprofit whose board I was on, and a few friends’ businesses. Miraculously, 20+ years after high school, I found work incorporating programming, writing and art! I’ve come a long way from those days of using Front Page 95, as now I focus on WordPress development. Since then I have designed and built over 600 websites. Q: What obstacles did you face when starting your web design business, and how did you overcome them? A: The first obstacle was finding a single title that adequately covered everything I thought I could deliver. Initially I used the term “information architect” as a way to harness several different skills and work types under a single umbrella that would appeal to both small businesses and my former corporate employers. Along with this came the challenge of creating a business name that also encompassed everything I provided to clients. Collective Discovery was a term that evolved from a brainstorming session with a friend, intending to cover the wide range of activities that go into collecting information and organizing it into a cohesive product to tell a story. 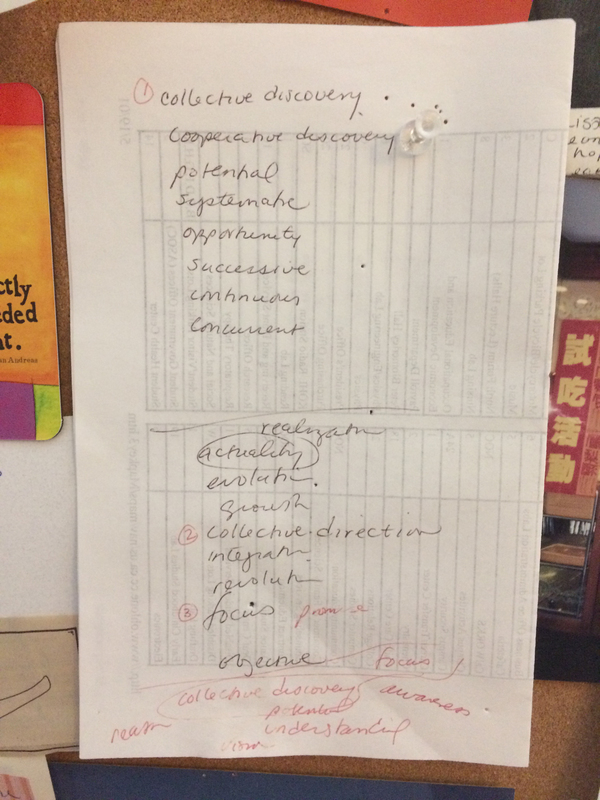 I kept the notes from that session, and it’s still on my bulletin board as a reminder of how far I’ve come. Despite my aggressive “do everything” approach, I learned early on that you can’t be all things to all people — and still be good at all of it. Within a few years, my business was focused almost completely on websites for small business and nonprofit clients, and supporting print collateral for those clients. With enough work in those areas, I left the corporate projects to others. Over the years I further refined my scope to only certain types of sites, and rarely take clients outside my major metropolitan area. Q: What’s your guiding business philosophy? A: Speak precisely, listen forgivingly. I’m known for over-communicating. I’d rather spend an extra 10 minutes crafting an email with explicit instructions than assume clients will understand anything implied or technical terms. On the receiving end, I take the opposite approach: I try to listen with an open mind, and never take for granted that the client’s instructions should only be taken literally, even if it doesn’t make sense. If there is any ambiguity, I’ll ask for clarification. Be responsive and meet commitments. If I say I will do something, I will do it. I’ve learned to be very good (and very cautious) at estimating time and effort per task. I’d rather under-promise and over-deliver, than vice versa. Look for the unexpected contribution. I try to always be on the lookout for ways to make a contribution above and beyond expectations. If I see something that needs doing, I do it. People love that! Q: What strengths do you bring to the table as an entrepreneur? A: Obsessive organization. I was voted Most Organized in my senior class in high school. At the time, I didn’t appreciate the value associated with organization. Now, it is most definitely a differentiator. I rely on checklists and templates to keep me on track. Uber-responsiveness. Too many clients were disappointed by previous web designers who failed to deliver, or disappeared entirely. Their complaints: “He was not responsive.” “She did not put my needs first.” “He never took initiative.” My goal is to never have anyone say that about me. Ever. So far, so good. Business understanding. While I have no formal business degree such as an MBA, I did have a first career of almost 20 years in Corporate America, with roles as an individual contributor, project manager, department manager, and program manager for executive staff. I received excellent business training and mentoring, and I learned about strategy, interpersonal skills, problem-solving, and being a mentor myself. Now, when I meet with clients who are new business owners, I’m able to help them with some strategic tasks, well beyond implementation of their website. Q: What online tools do you use for your business? A: I’m all for tools that make me more efficient and productive. A big success factor for me is focusing on a specific segment of the web business, and doing it very well. It makes sense to me to focus on service providers where I can learn their system and be very efficient within it. I now work primarily with WordPress, and the GoDaddy Managed WordPress hosting package is perfect for so many of my clients. If I’m lucky enough to connect with a client at the very beginning of their website experience, it’s what I recommend. If they are hosted somewhere else that I feel is inadequate, I’ll get them moved as soon as it makes sense. GoDaddy Pro helps to streamline the high-level administrative management of so many sites. I was fortunate to start using it in early Beta. I made suggestions via discussion boards and I felt that the team actually listened to me (and other developers) to create something that serves us well. While The Garage may not count as a tool in the traditional sense, it’s also a great resource. In addition to new and relevant articles every day, it’s provided me with resources I can send clients to, regarding SEO, social media image sizing and more. Q: What’s the most valuable lesson you’ve learned since starting your business? A: Engaging with the right clients for me — and only the right clients —has made my work so much more enjoyable and productive. In the early days, I’d take any client, and any project – most self-employed people will agree: you never know how much work you’ll have tomorrow, so you don’t want to turn down work today. Now, I evaluate every potential client as to whether they are a good fit for me (and whether I’m a good fit for them). On the flip side, it’s key for clients to hire the right web designer for their needs. I think most people look for a web designer and just hope they will find someone to do the job — but they do not necessarily find the right someone. My observation of many mismatched relationships is what led me to write Web Diva® Wisdom: How to Find, Hire, and Partner with the Right Web Designer for You. Q: What’s your best advice for other entrepreneurs or new web designers just getting started in the field? A: Request informational interviews with established web pros. Dig into not only the technical aspects, but their day-to-day operations, processes, policies, pricing, tools, and back-end business management. I am often asked to answer questions, or meet with new grads interested in web design. I love doing it; I think most web pros would feel the same. Buy me lunch or a cup of coffee, I’ll share everything I know. Build your network of Power Partners. Work together with peers providing complementary services. Even if you’re a technical wizard, you can’t excel at everything. By referring your clients to other trusted professionals who provide what you can’t, everyone wins. I consider GoDaddy to be one of my top Power Partners, as my preferred hosting vendor.